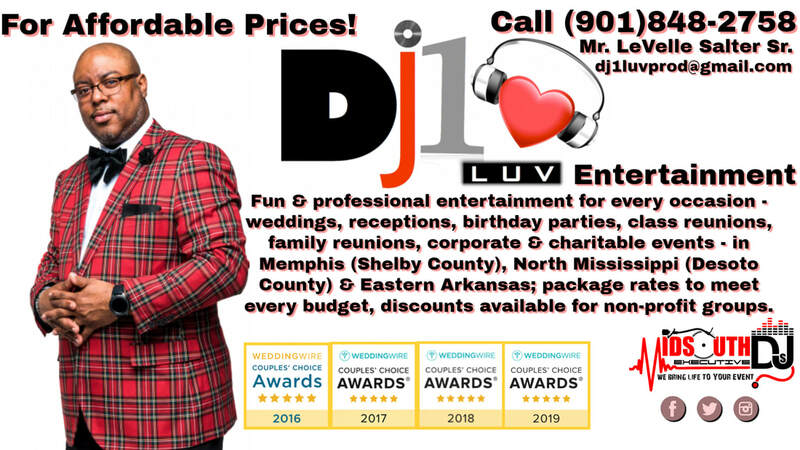 DJ1LUV Entertainment Karaoke & DJ Service: fun and professional entertainment for every occasion - weddings, receptions, birthday parties, class reunions, family reunions, corporate and charitable events - in Memphis (Shelby County), North Mississippi (Desoto County) and Eastern Arkansas; package rates to meet every budget, discounts available for non-profit groups. Sharing LUV on the 1's & 2's one song at a time! LeVelle was a gifted child who began singing and playing percussion's at the age of three. Because of LeVelle’s singing and music abilities he traveled with his father’s gospel quartet, The Vision Gospel singers and also played percussion's for the Award Winning Westwood Marching Band. With roots in Memphis, TN and having influences from his musically inclined family including his cousin, Willie “Too Big” Hall. Willie Hall was apart of the Blues Brothers and played with greats like Isaac Hayes, Al Green and many others. LeVelle also pays musical homage to his late uncle Toby Webb who was a well sought after bassist around the world. Today LeVelle Salter, Sr. owns and operates DJ1Luv Entertainment, a mobile music and entertainment business. LeVelle has received the Certificate of Recognition for Outstanding and Meritorious Contributions to the Memphis Community for The Bully The Bull Foundation. He also received the Wedding Wire Awards for the past three years 2016/2017/2018/2019. In addition, LeVelle is the resident DJ for ILoveKickboxing Bartlett and The Hope Foundation. He's also the premier DJ for Uniquely Yours Wedding & Event Planning. LeVelle has mentored and provided event entertainment for the Stax-Soulsville Music Academy. LeVelle is a professional, energetic, and charismatic person who has a genuine love and appreciation for music. He also a family man he uses his passion for the arts to reach many and is handing down the musical legacy to his children. Moreover, LeVelle is a dynamic Emcee and offers an extensive music catalog to tailor any occasion.